TUARAN: Nine locals, most of them said to be from Ranau, were picked up at the Tamu grounds Sunday morning for allegedly being involved in activities of a seditious nature. Three others, who were said to have been signatories to a petition promoting Sabah rights being carried out by the group, were also hauled up by police, according to witnesses, but there was no mention of them at a press conference later on. All nine, aged from 24 to 50, three of them women, were released nine hours later after their statements were taken down and after they posted an un-deposited police bail of RM2,000, with two sureties. Their arrests at about 9.15 am caught the attention of local opposition politicians, including former Chief Minister, Datuk Yong Teck Lee, who rushed to the police station to offer legal and moral assistance. They were however locked out as the gates were closed while a light strike force (LSR) unit stood by some 10 metres away. This caused some tension at the scene as Yong clamored that he and some lawyers be allowed to visit the detainees so that they could be offered legal advice. A senior police officer, identified as ASP Solihin however said no one was to be allowed in, though he later (at about 5pm) allowed 18 people, said to be friends of the detainees, to enter so they could post bail. As catcalls were raised, the group then unfurled two Sabah flags and sang the ‘Sabah Tanah Airku’ (Sabah My Homeland) state anthem. Later former deputy Labour Minister and Tuaran MP, Datuk Kalakau Untol and former Petagas Assemblyman, Datuk James Ligunjang were also seen outside the police gates. Most of those detained were wearing their traditional costumes but there were some who had t-shirts on with the words SSPR (said to refer to Semangat Satu Perjuangan Rakyat) or In One Spirit for the Peoples’ Rights. Witnesses told Sabahkini.com that the nine were part of a larger group who had planned to collect signatures for a petition on Sabahan rights as well as distribute leaflets at the tamu outlining their struggles. They said police suddenly swooped down on the nine, plus three others who had signed the petition, and ‘handcuffed’ them with plastic cuffs, before taking them to the police station nearby. The others who escaped the police dragnet soon started flooding social media with photos of their ‘handcuffed’ comrades as well as their arrests. This got the attention of Yong, who with several of his SAPP members went to the station at about 3.00pm only to find themselves denied entry. 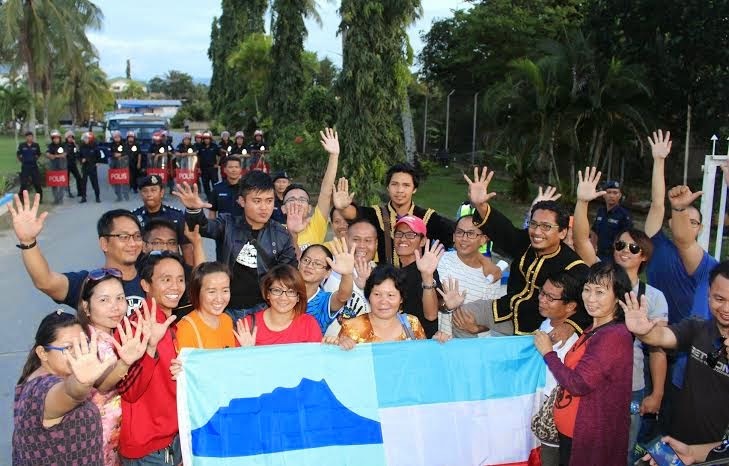 The detainees were finally released at 6.15pm and marched out with their bailors; and on reaching the police gates heartily sang the Sabah Tanah Airku. Leaders were carried shoulder high as they celebrated their release. Sabah Officer in Charge of Criminal Investigations (OCCI) Senior Assistant Commissioner, Sallehudin Abdul Rahman when met at about 8.10pm at the station, confirmed that police believe those detained had connections with SSKM (Sabah Sarawak Keluar Malaysia or Sabah Sarawak Secede from Malaysia). He said those detained were being investigated under the Sedition Act for indulging in activities that were seditious in nature. He did not elaborate though. Sallehudin said police had yet to complete their investigations and once it was over, a report would be handed over to the Attorney-General’s chambers for further action. “Well done @Sabah police arrest nine individuals in Tuaran for distributing brochures instigating the people to get Sabah out of Malaysia. WELLDONE Boys,” he said. He, however, declined to comment further when contacted by Bernama. It is understood that police have retained the handphones of those detained, telling them they were required for police investigations.